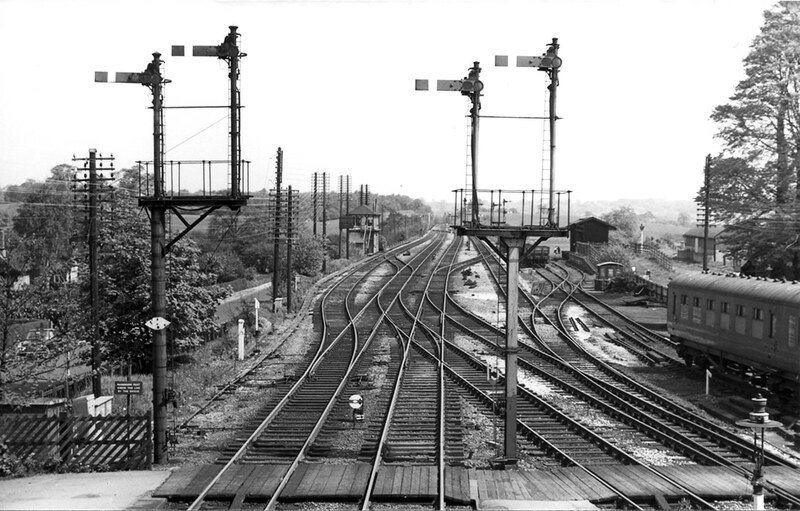 ABOVE PHOTOGRAPH BY PETER HANDS TAKEN ON A BROWNIE 127: A panoramic view of the layout of Barnt Green station in 1964 looking towards Birmingham from the footbridge. In the left of the frame are the up signals for the slow and main up lines from Bromsgrove. The signals to the right guard the access line from Redditch and in the left distance is the signalbox. WHAT HAPPENED TO STEAM was produced in the 1980’s on a shoestring budget after many years of research (initially as a hobby), using the railway media, contacts and my vast personal records. Far from being a money‑spinning exercise, as one report in the media suggested, it was more a labour of love by a dedicated steam enthusiast who simply wanted to pass on his knowledge to fellow enthusiasts. Unfortunately, there turned out to be a fly in the ointment in the shape of a rogue correspondent who had been supplying me with fabricated disposals (unbeknown to myself) whilst I was doing my on‑going initial research. Mistakes have been made for which I would like to apologise to all who purchased my booklets. Some were my fault, others came about by incorporating what has since turned out to be wrong or misleading information published in railway periodicals at the time I was doing my initial research, plus the falsehood of the rogue correspondent. We are all human and there are errors in most publications. It is easy to forget that WHTS was a pioneer series and that much of the knowledge available today was very hard to come by in the 1970’s and 1980’s. Given the vastness of the subject, it was inevitable, if most regrettable, that mistakes were made. Taking into account the adverse publicity which has been aimed at WHTS over the years from certain sections of the railway press it speaks volumes that during my travels to numerous railway venues I have only discovered a handful of booklets for resale. My only conclusion to this is that collectors of WHTS have more faith in my work than my detractors. All are invited to participate in this venture and constructive criticism is always welcome‑ long live steam.